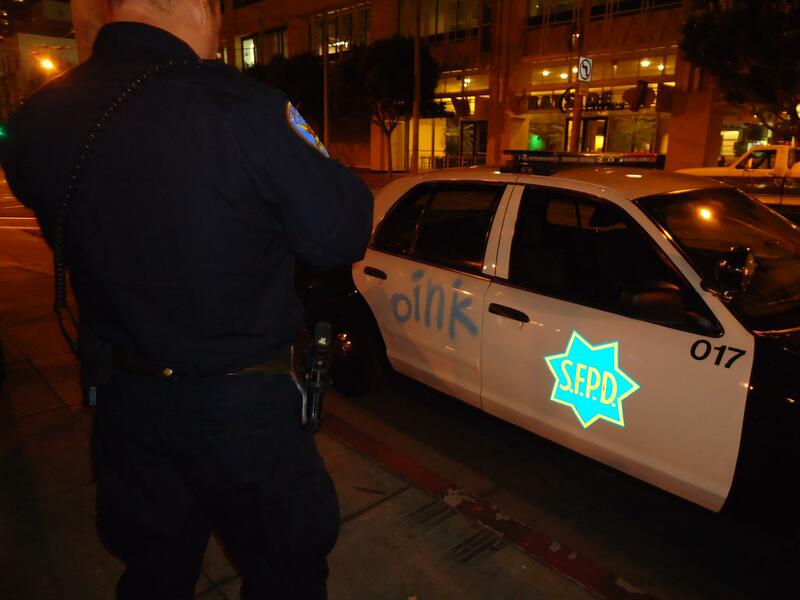 The general feeling towards the violent behavior of the Oakland and other Bay Area police departments is captured clearly in this pic from my friend, Michael Sierra. While President Obama was telling the small crowd at a $7500-a-plate fundraiser in San Francisco that “Change is possible,” Pooda Miller was across the bay trying to get her plate back from the Oakland Police Department. “They came, pulled out rifles, shot us up with tear gas and took all our stuff,” said Miller, at an afternoon rally condemning the violent evacuation of more than 170 peaceful, unarmed Occupy Oaklanders by 500 heavily-armed members of the Oakland Police Department and other local departments yesterday morning. 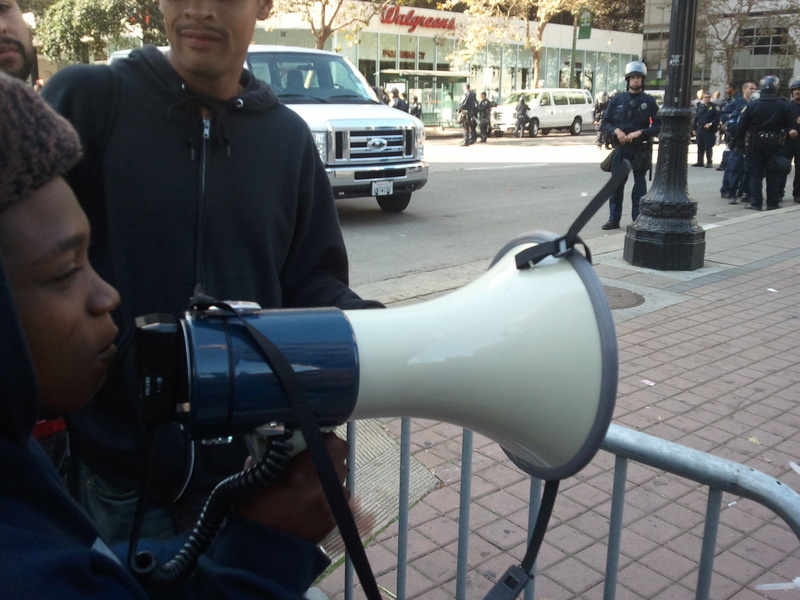 With a long metal police fence separating Miller and other members of Occupy Oakland from their confiscated items—tents, water, food, clothes, medicine, plates—and now possessed by the police, Miller grabbed a big blue and white bullhorn that looked like it was almost half of her 4-foot, 5-inch frame. “Give us our stuff back! It don’t belong to you!” yelled Miller, who also expressed relief that her baby was not camped out with her that morning. The sound of Miller’s ire shot across the protective masks of all of the officers standing at alert on the other side of the metal police fence, but her loudest, most acidic anger was saved for the baton-wielding officer who, like herself and other officers, was a young African-American woman. Miller’s questions about the role of race in the policing of Occupy Oakland points to what is and will continue to be the larger question in Oakland and other U.S. cities where former “minorities” are becoming majorities: What does it mean when those charged with defending elite interests against multi-racial and increasingly non-white activists are themselves multiracial and non-white? The ongoing protests, mayor recall, phone calls, emails and other pressure and pushback of Occupy Oakland are no longer aimed at cigar-smoking white men. They are aimed at a power structure in Oakland whose public face looks more like Miller and other non-white protesters. 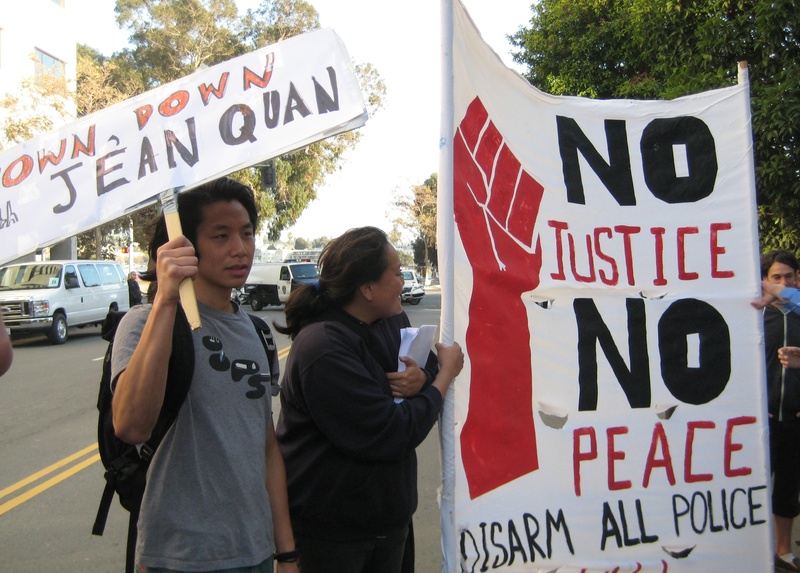 Miller and others are calling for the recall of Jean Quan, who made history as Oakland’s first Asian-American mayor (full disclosure: Quan’s daughter is my Facebook friend); and they are complaining about the use of excessive police violence authorized by Interim Chief Howard Jordan, an African American. Such conflicts between former minorities are becoming the norm in what more conservative commentators call the “post-racial” era ushered in by the election of Obama. 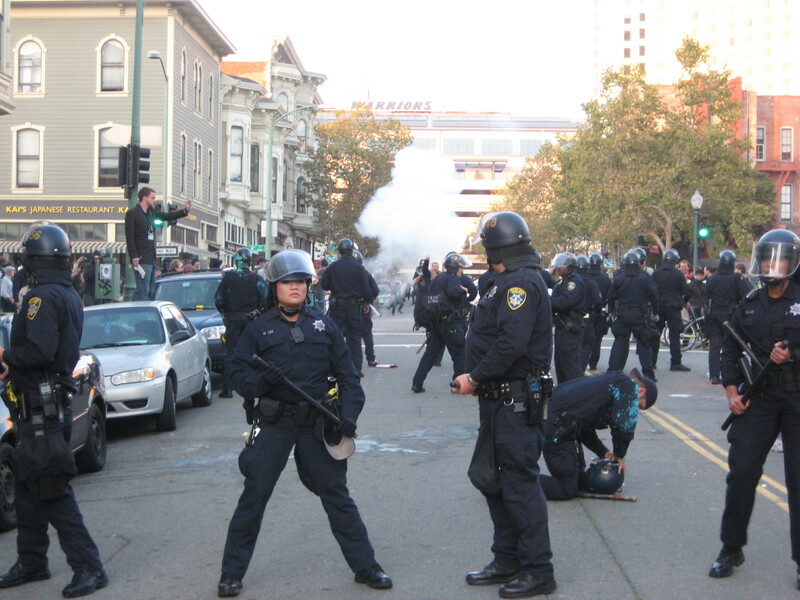 Many like Miller and other Occupy Oaklanders are having second thoughts about what feels like the affirmative actioning of policing and state violence. 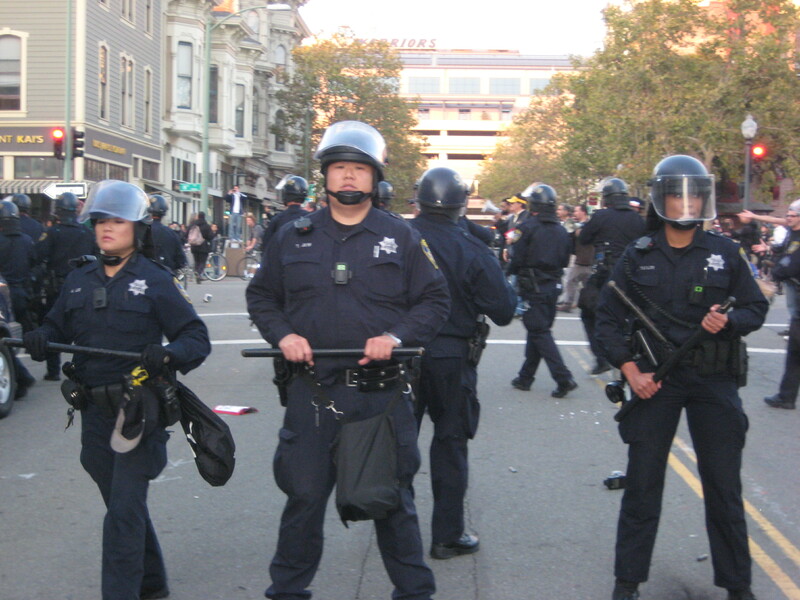 Others, like Ofelia Cuevas of the University of California’s Center for New Racial Studies, see the workings of a not-so-21st-century pattern of policing and power. 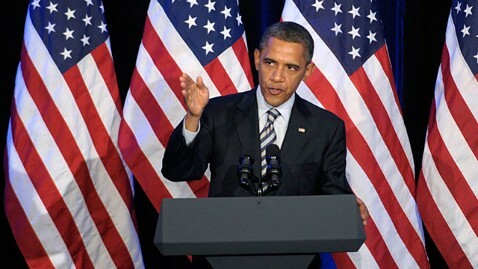 Cuevas noted that big city mayors like Quan or Los Angeles Mayor Antonio Villaraigosa are, by electoral and structural necessity, required to act like any of their predecessors, who headed up police forces that attacked, surveilled and even killed those perceived as a threat to the establishment. The Bay Area police’s violent modern history stretches from OPD’s assault on the Black Panther Party—which was founded just blocks from the center of Occupy Oakland, re-named Oscar Grant Plaza—to the killing of Grant, a young black man shot in the back by a transit police officer at a nearby train station. 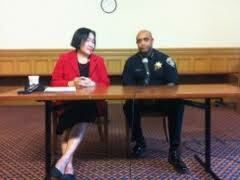 “Being mayor is being pro-police. They perceive that it’s their job to crush what they consider threats to the status quo,” said Cuevas.